DIY Wreaths for the Holidays that Won't Cost you a Cent. DIY Wreaths for the Holidays that Won’t Cost you a Cent. 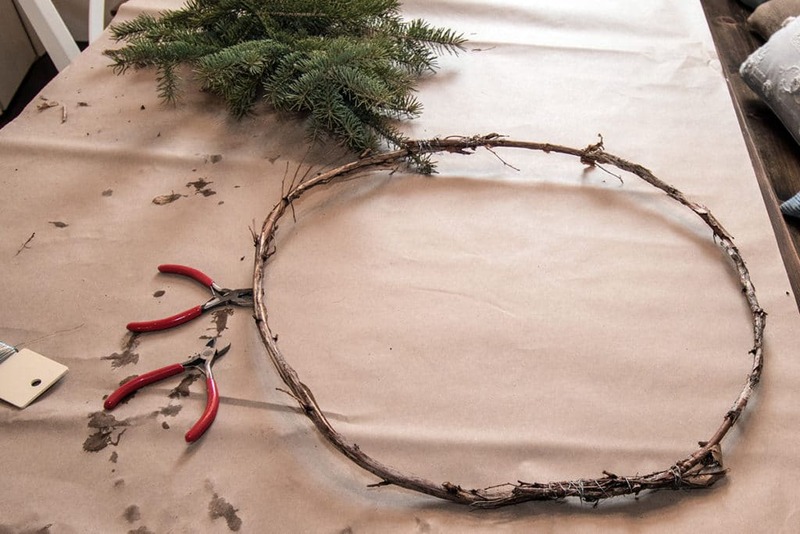 DIY Wreaths you can make yourself, for free, without going out to buy any materials. This is the ultimate budget Christmas decorating project. All it takes is a bit of time and a few materials from Mother Nature. 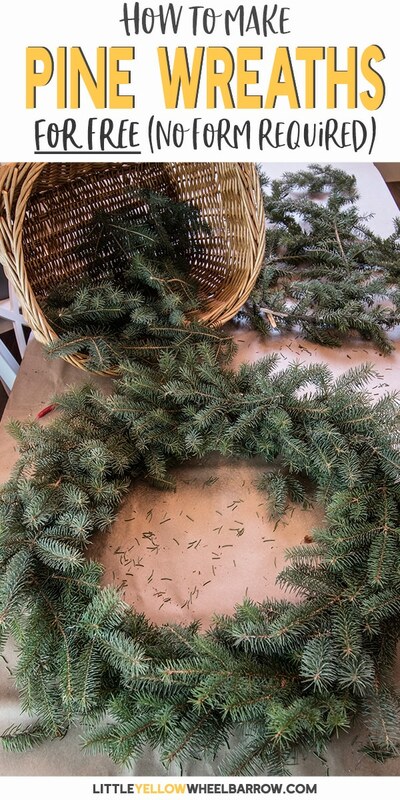 Anyone can make these evergreen wreaths; the tutorial is step by step and couldn’t be easier. 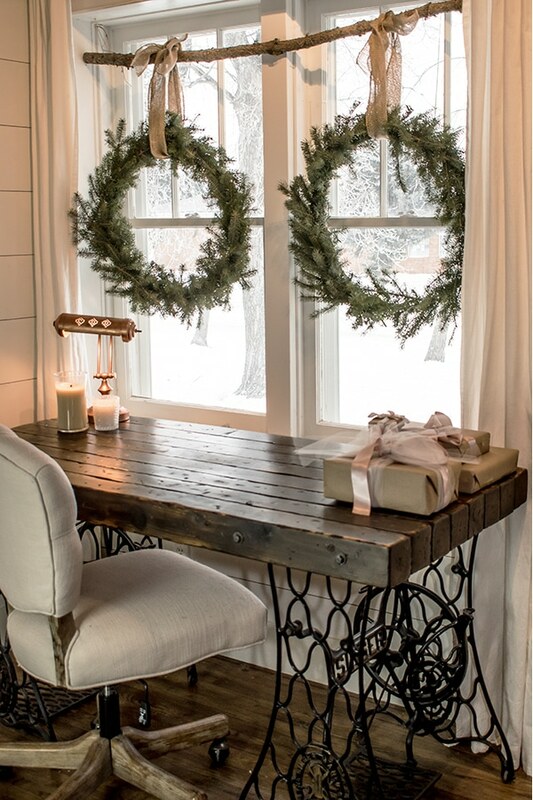 How about some vintage pine DIY wreaths in a rustic window display. These wreaths can be as big or as full as you want them to be. I wanted mine to look vintage. Something you might find in an idyllic French Christmas scene circa 1800 something. My wreaths are a bit thinner because I didn’t want a fluffy wreath. Instead of trimming them to get a nice uniform look, I also left them disheveled and poking out all over. Rustic! That “rustic” look fits well with the feel of my home, but maybe not for yours. That’s ok… if you want your free pine wreaths to be fuller and more modern looking, you can still get that look with these forms, it just takes a bit more time and fussing. These are free DIY wreaths, but you still need to find the trees! 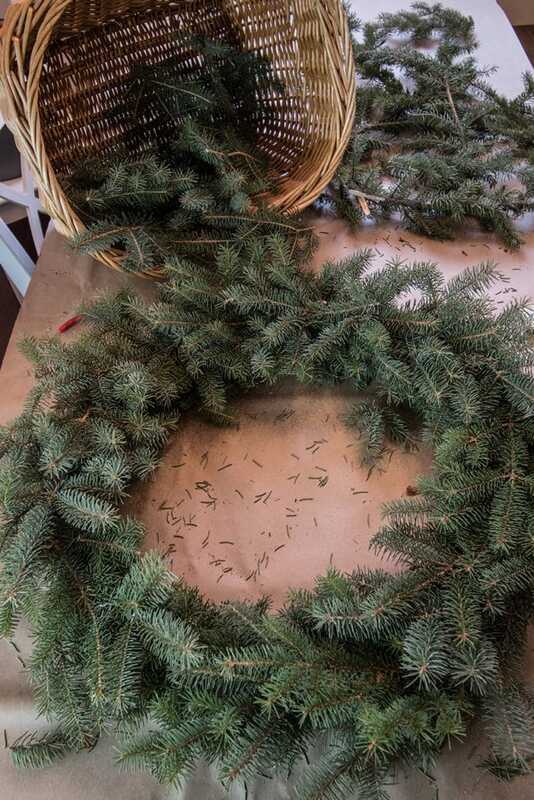 So a few things – to make these DIY wreaths you will need to have access to some evergreen trees. If you live in the desert or a balmy warm climate I am not at all sorry that you cannot complete this project. While I am freezing my face off with – 30 degree weather you’re drinking cold drinks in the sun, so technically you win life. I have no sadness for you. Sorry. I digress – but seriously, if you live in a warm climate with no evergreen trees we should be friends and you should invite me for drinks. Oh yes, back to these wreaths. You will need access to some trees; pine, spruce, cedar, any evergreen tree that is worthy of being turned into a wreath will work just fine. You will also need access to smaller trees or bushes with thin bendable branches. Think shrubs like lilac, or hedges. 22 Gauge wire/ or you could use fishing line, or even small butchers twine, whatever you have. But the wire makes the job go easier. 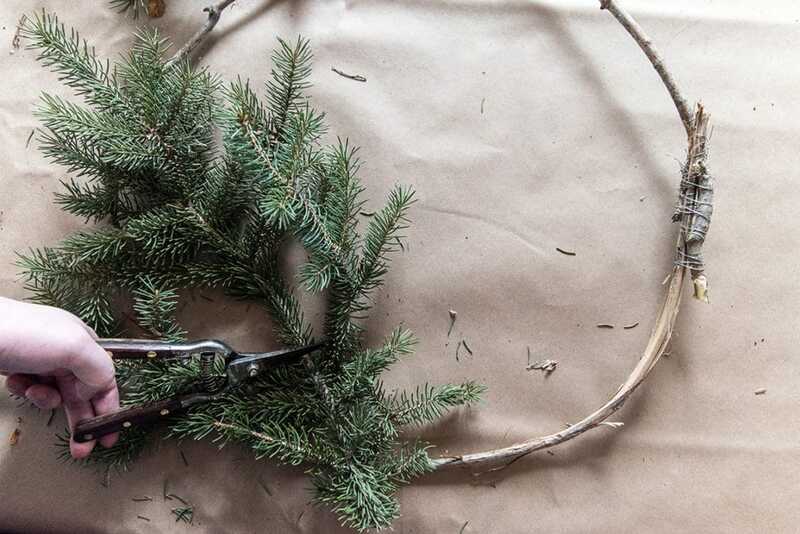 If you want to make the rustic branch for the DIY wreaths to hang from, make sure you cut a nice size branch off your tree. Look for something at least 2 inches in diameter. No trees were harmed in the making of these wreaths – I took off a lower branch that was due for some trimming in the spring. Don’t send me angry tree loving emails – I love my trees! Use garden trimmers and snip off all the side branches. 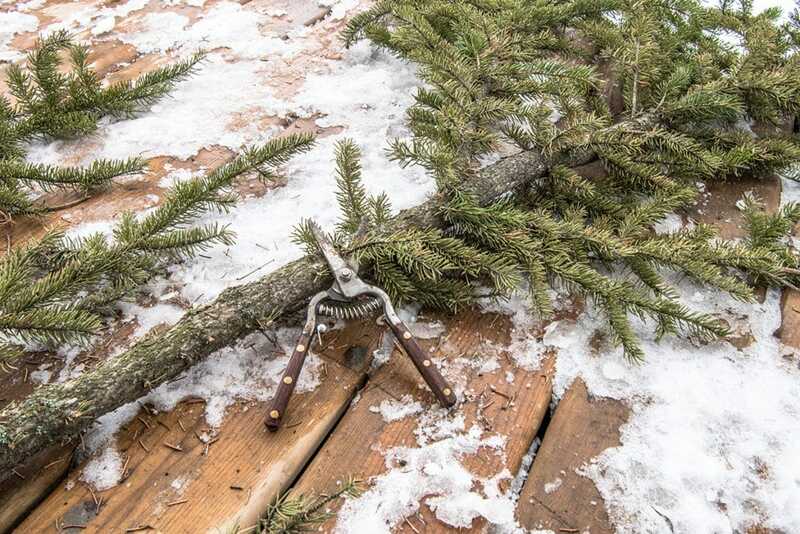 If you hit a branch that is too big to snip off use a handsaw. Save all your pine trimmings because you will use them for your wreath. Making your wreath form is fairly easy. You need two straight branches, measuring 1/2 -3/4 inch wide and about 30 inches in length. You can trim them down to any size you want, but it’s best to grab them around that long to start out. I used lilac hedge branches, but any branch will do so long as it is straight and will bend. If you make your wreath forms any larger than 48-60 inches around, I would suggest making two forms and attaching them together so they reinforce each other. As the pine boughs are added it puts a bit of weight on the forms. Doubling up just ensures they won’t break. Make sure the branches you pick are bendable! You do not want old growth here because they will be too dry and will not bend, they will simply crack. 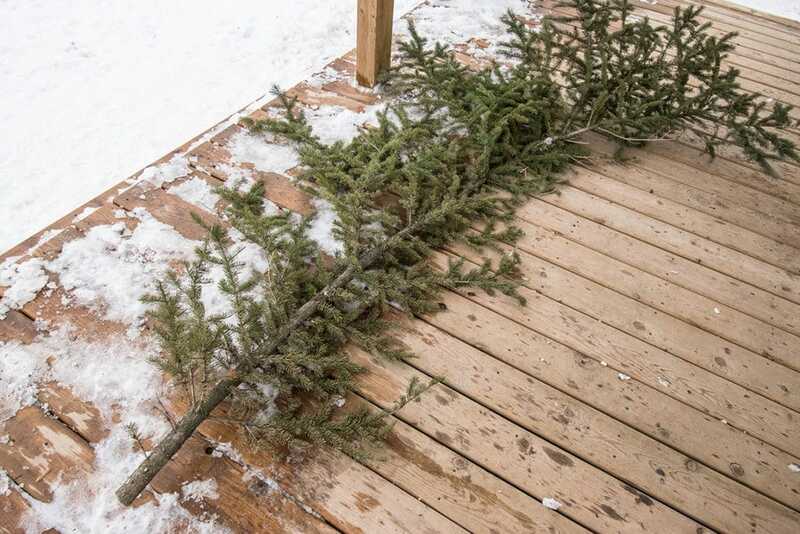 Trim off any excess stems or branches. 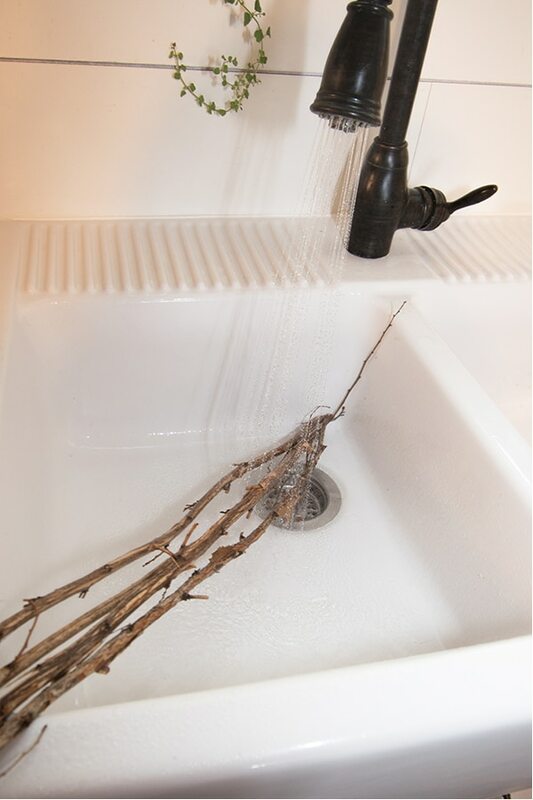 Once the branches are cleaned up they need to be soaked down with warm water for a minute or two. Dampening down the branches will help them bend. Lay two branches side by side. Use your wire to fasten them together – it doesn’t have to be pretty, it only needs to be well fastened. Once the pine boughs are attached you won’t even see the wire. Once the first side is fastened, bend the whole thing into a circle and fasten the other side with more wire. If your shape is not quite round you can gently bend the branches into shape, but “gently” is the keyword. I broke a set doing this because I was a bit too rough. I made four of these wreaths and all of them ended up more or less round. No weird shapes, they all ended up being fairly circular in the end. If you do get a weird shape, I would suggest starting over and trying to bend two different branches. If the circle is off a tiny bit, don’t worry about it, you can always sort it out as you trim and add your boughs around the wreath form. Once it is dry test it. Gently tug on the sides to make sure the form will not come apart and that it is sufficiently wired on both sides. 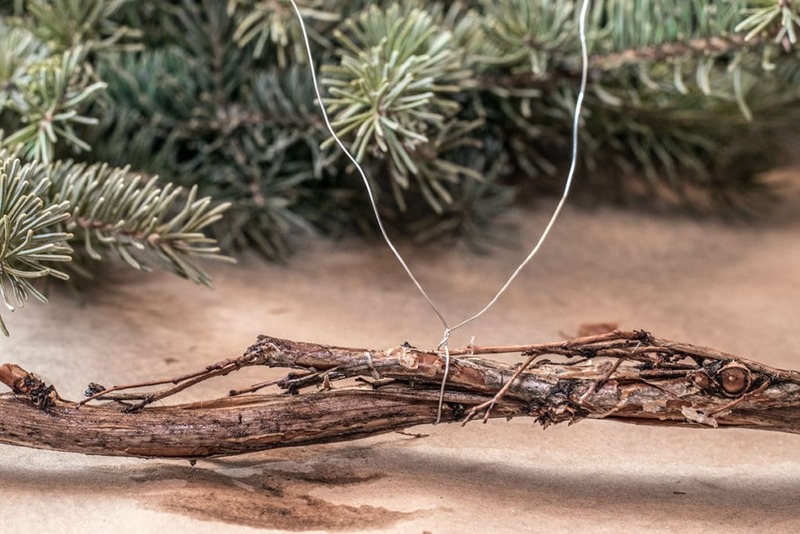 If it feels a bit loose, or not quite secure, add a bit more wire around where you attached the branches to each other. Look for lush green, full tips on your branches, those are the pieces we want to use for our wreath. Separate the evergreen tips so that the best looking, most lush branches are set aside. See in the photo below how lush and full that tip is, that’s what we want for the top of our wreath. We can use the not so great ones on the bottom layer. The first layer of pine branches is intended to create a base for the next layer. This layer does not have to be perfect, or beautiful, it just needs to attach to the frame securely. 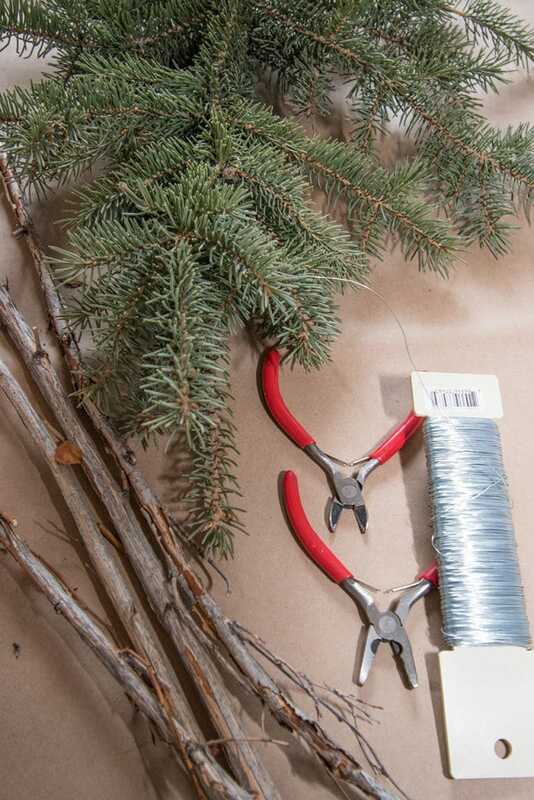 Add lots of wire around each evergreen tip as you attach it. The length of the tip doesn’t matter, so long as it can bend with the frame, and there are full tips almost the length of the clipping. The next round is a bit different. You’re going to want to find your best-looking tips and start laying them down one by one. They will need to be overlapped like fallen dominos all aways around the wreath in the same direction. Each time you add a new branch, tie it down with wire, and then add the next and do the same until you make it all the way around. The tighter you make these overlaps, the fuller the wreath will be. 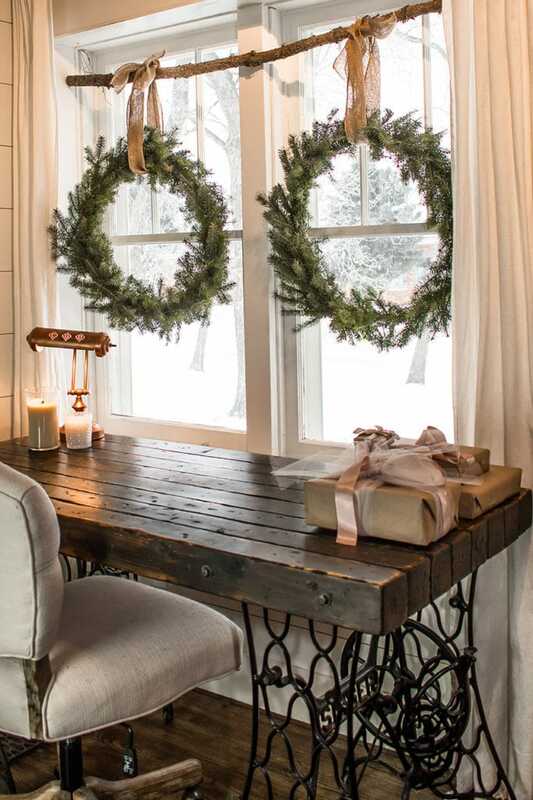 To create the rustic branch wreath hanger I simply cut my big branch down to fit my window and tied it up in the corners with some cup hooks. My husband had a stroke that I did that to the windows I spent 4 months restoring, oh well! I used some twine to attach my branch to my cup hooks. You can see it in the photos, but the curtains do a good enough job hiding it that I didn’t fuss. I used some leftover burlap ribbon to attach the wreaths to branch. I tried to get some good photos but the sunlight just wasn’t co-operating, but these DIY wreaths do look pretty hanging in my windows! They match the rustic vintage vibe I have going on in my home. There really is no need to spend a fortune on Christmas decorations. 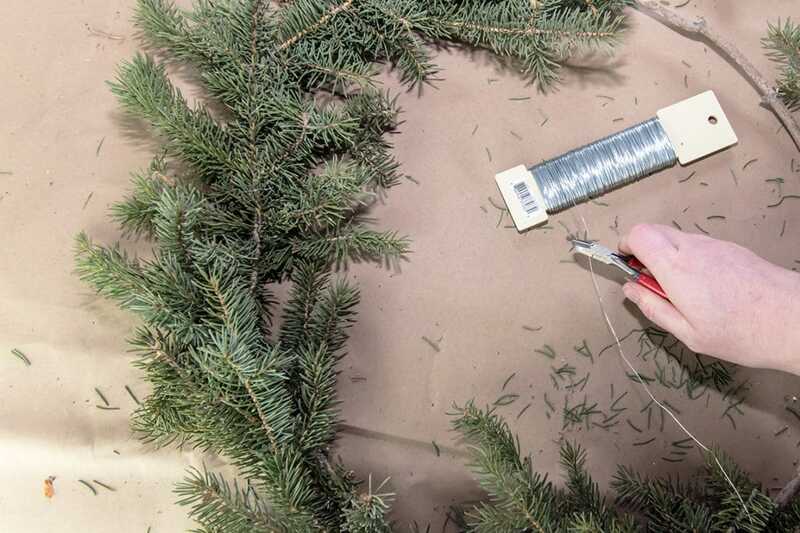 If you have access to a few evergreen trees you can make your own holiday decor. Think DIY wreaths, boughs for a staircase, or even decorate the top of door jambs, all kinds of things! You also don’t have to buy a lot of fancy materials. Use what you have on hand and see what you can come up with. A Cozy Crochet Wreath to make for Fall, or Winter, or Whenever! These wreaths are gorgeous!! I love a good free diy!! You explained the steps perfectly, i’m defiantly going to try this. THanks for Sharing!!! Thanks Cate!! I love a good free DIY too, something that doesn’t cost me a cent but still looks good. Good luck with your wreaths and if you do make them come on back and drop us a note to let us know how it goes. Cheers! Hi Holli, yes, just like a fresh Christmas tree they will dry out. 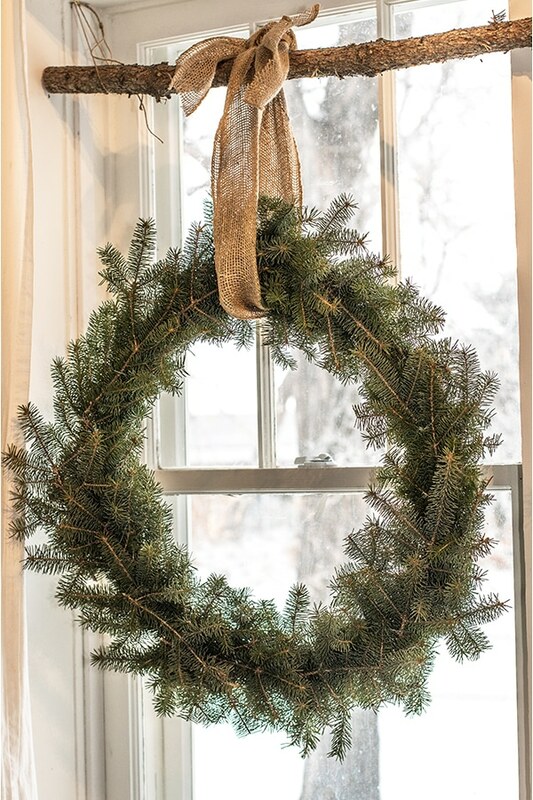 A pine wreath that starts off with well-hydrated branches will last approx 3 weeks. I give mine a light spritz with fresh water every few days to keep them hydrated. Great question, I will add that information to the post! 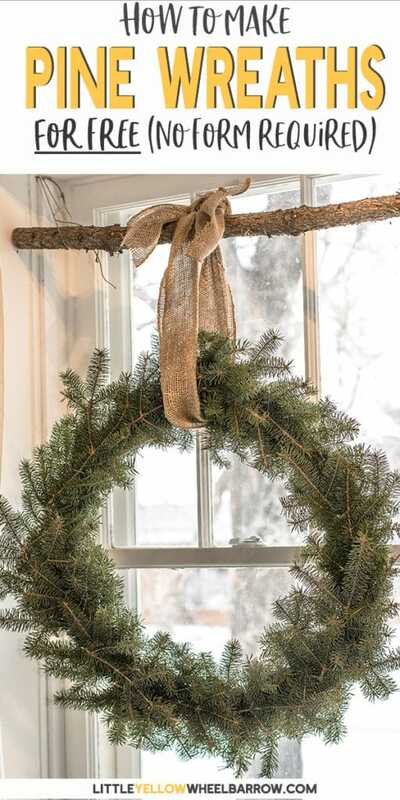 What a wonderful post and tutorial for a FREE pine wreath! Great idea, Laura! And great new video, too!